With so many different types of dog food available for purchase, it’s hard to know which one is the best fit for your dog. So what makes Canis the perfect solution?  We’re proud to be the first ever Cold Pressed dog food that’s made right here in the UK! Research shows that 73% of British people think it’s important to buy British-made products, as it helps support our country’s economy and minimises our carbon footprint. We’re also proud to say Canis is a game-changer for dog nutrition! Our recipes are crafted using a Cold Pressed technique, which allows us to create healthy complete dog food without compromising on nutrition and taste. Cold Pressing is a unique process that means we can prepare your dog’s food without the need for high temperatures, which can damage vitamins and minerals. Canis breaks down in your dog’s stomach like human grade and Raw diets, rather than swelling like a regular extruded dog food. This makes the digestion process much easier for your dog and avoids bloat. It also means Canis is suitable to feed alongside a raw diet, perfect for all you raw feeders out there when you go on your holidays or simply want something a little more convenient! Cold Pressed dog food retains more of its natural nutritional than other dry foods. How? We don’t take shortcuts and you won’t find any chemical additives or filler in Canis. Each delicious nugget is made in small batches with the highest quality ingredients! If you want to read more about our product please head over to our Frequently Asked Questions.